Are you a binge drinker? Chances are, your answer is emphatically not! Binge drinking? Sounds like my freshman year of college, pulling all-nighters and drinking the night away, without a care in the world. “Binge drinking,” by definition, constitutes four alcoholic beverages in a two-hour time span for women, and five drinks in a two-hour time span for men. The two-hour time span is worth noting, as our bodies cannot metabolize the alcohol quickly enough which causes drunkenness. Binge drinking can have serious health risks over time. 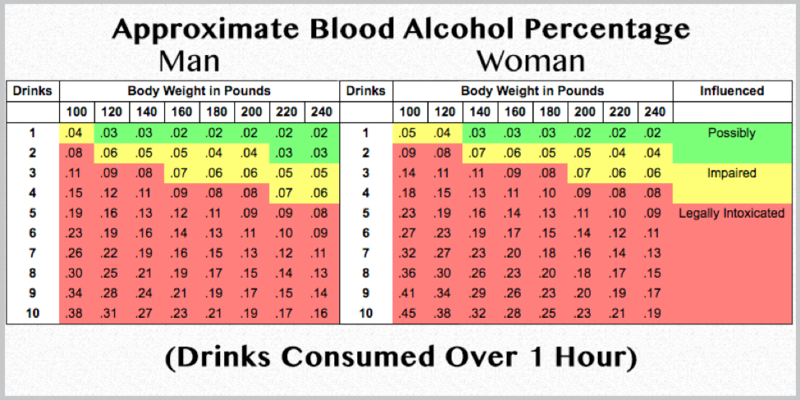 Per the Dietary Guidelines for Americans, safe alcohol consumption is one drink a day or less for women and two for men. So where is the happy medium? How can you find your balance with alcohol, especially when you are trying to find your balance for so many other health behaviors? Everything in moderation, right…. (except for your leafy greens of course)! Studies suggest it is not as simple as just one drink a day for women and two for men. First, not all drinks are created equally! Some have different alcohol contents, some are flavored, and sometimes your friendly neighborhood bartender pours you a little ¨extra”. (Yay for the neighborhood bartenders!) 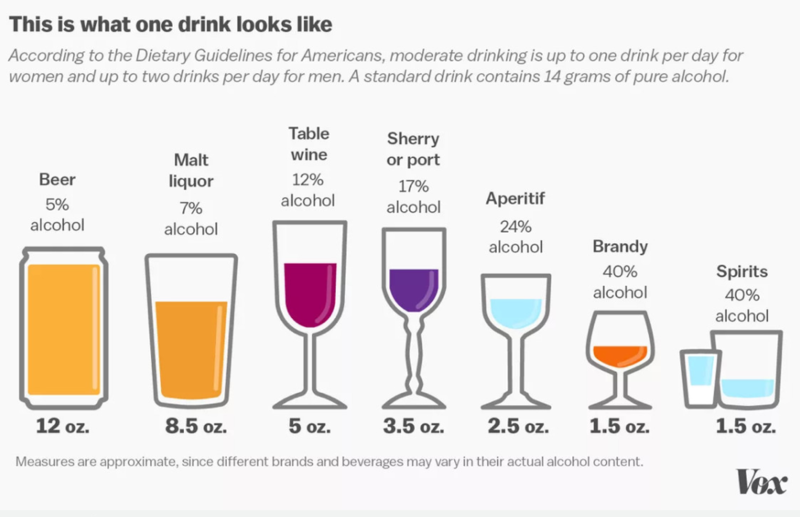 But here’s a breakdown of a standard drink: 12 ounces of beer (5% alcohol), 5 ounces of wine (12% alcohol content), or 1.5 ounces of 80-proof distilled spirits (40% alcohol). Next, let’s consider your health goals. Someone with a weight loss goal might drink differently than someone who is looking to maintain. A person living with a chronic condition, for example, needs to talk to their care team about the effects a drink might have on their medications or condition. In addition, drinking puts your body to work and pulls it away from other bodily functions. Once you take a drink, your body makes metabolizing it a priority — above processing anything else. Unlike proteins, carbohydrates, and fats, your body doesn’t have a way to store alcohol, so it has to move to the front of the metabolizing line. This is why it affects your liver, as it’s your liver’s job to detoxify and remove alcohol from your blood. It is also important to note that excessive drinking can lead to certain cancers as well. So, how do we have a healthy relationship with alcohol when there is so much information to take into consideration? Before we jump into these tips, it’s important that we first reiterate how important it is to chat with your clinician about your current habits, and see if they have any recommendations specific to your situation. Pace Yourself – If we know our bodies cannot metabolize alcohol as fast as we are drinking, slow it down. Sips instead of gulps, be present and mindful and put the glass down between sips. Some folks will keep their stir straws after each drink so they won’t lose count of how many they have had. Others will consistently sip on ice water while they are drinking. Avoid Sugary Mixers (like Red Bull, fruit juice, flavored cordials) – If you want a tasty beverage and just can’t have straight vodka/soda water with a lime for example, ask for a *splash* of your favorite mixer. There is so much sugar in some of these mixers, a splash will go a long way. #PROTIP: Triple Sec (one of the main ingredients in a Margarita, Cosmopolitan) has a lot of sugar in it – orange oil or zest can be used as a substitute if used in the right quantity. Eat Before you Drink – This will absorb some of the alcohol. It’s particularly good to eat high protein foods such as cheese and peanuts, which help to slow the absorption of alcohol into the circulatory system. Give Yourself an Hour – Stop drinking at least an hour before you go to bed and drink water before you do! You want as much of the alcohol to leave your system before you go to sleep. This will allow you to wake up without being dehydrated and feel rested. Otherwise, once the alcohol wears off, your body will be tossing and turning in anticipation of the next day’s hangover! Quality Over Quantity – Know your booze. When ordering a drink, get specific. If the bartender does not ask if you have a preference on the vodka you are about to drink, they will probably serve you “Well” liquor. “Well” is the cheapest mixed liquor and will likely give you the biggest hangover. The next step up in taste and price range is a “Call”. Finally, you have “Top Shelf”. If you can afford a top shelf, that is the way to go. The taste is much smoother and allows you to actually enjoy the craft of distilling. #PROTIP: Tequila/Water/Lime is great for folks who are trying to lose weight. The agave nectar serves as natural sugar, keeping the sugar content very low for the beverage! Respect the Craft – A lot goes into brewing beer and distilling alcohol. By ordering up (Call or Top Shelf), you are more likely going to drink slowly, taking the time to savor the beverage. It also gives you something to talk about with the bartender or at the next office party, sounding like a real guru. The same ideology can be applied to wines and beer. Start Fresh – Give yourself a week or weekend off from drinking! Your taste will become more refined, and you will begin to hone in on your taste preferences. It also might slow your drinking down from every day to every other day once you see how good you feel after not drinking every day that week! #PROTIP: This is one of my personal favorite ways to stay in a healthy relationship with alcohol. Not only will you save money, but abstaining from drinking for even a few days can reverse the effects of “fatty liver” caused by excessive daily drinking. My taste buds always come back fresher, and I never seem to want to drink near as much as I did before the time off! Finally, always remember to talk to your care team about your alcohol consumption habits!